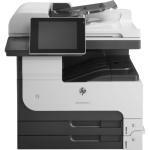 HP LaserJet Enterprise M725DN Expert Reviews - Read Reviews and Buy Smarter Online. Pros: -LCD color control display (iPad form factor) with capacitive touch -relatively quiet printing for a large workgroup printer -relatively quiet scanning for a large workgroup printer -highly customizable for setting up custom scan buttons for each user, e-mail notification of scan completion, etc. Verdict: I am giving it a high rating for the moment siince we were able to rapidly set it up for printer and custom scanning within minutes and no hiccups. Full-disclosure: this was a 'gift' from a vendor. Best printer that I've ever owned. Verdict: This is the nicest printer that I've ever had, I love it. There are so many features on it, and the touch screen is extremely easy to use.